Easter Island (Ahu-Akivi) Photo Credit: Wikipedia. Latitude: -27.1211919. Longitude: -109.3664237. A small Polynesian island in the south Pacific Ocean far away from any major land-mass is Easter Island, only discovered in the early 18th century, but it is a very extraordinary and mysterious island of giant stone statues and rock carvings, some perhaps dating back well-over 1,000 years. Also known as Rapa Nui, the “sacred” island of the mysterious tribe that are also called by the same name and who lived here, roughly, between 400-1700 AD. 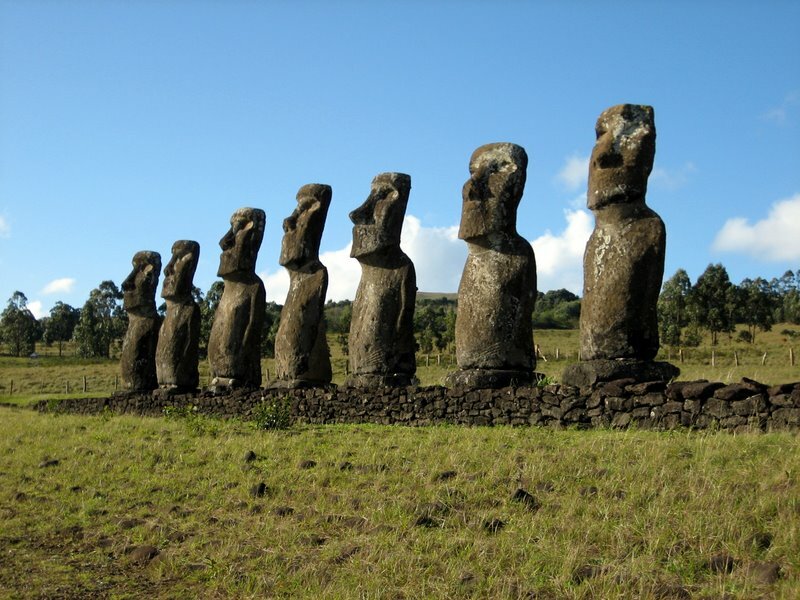 There are said to be upto 1,000 small and large stone statues on the island, many are said to represent the gods or chiefs of the Rapa Nui tribes; and there are many superb petroglyphs or rock-carvings scattered about the island. The island is 10 miles across north to south and about 16 miles length-wise at the south-side; also at the south-side a line of three dormant volcanoes: Rano Kao, Punapau and Rano Raruku, while at the north another volcano called Rano Aroi; the island being made of sandstone and volcanic rock. Easter Island, sometimes called ‘the Navel of the World’ is 1,200 miles from any other island and roughly 2,360 miles from any major land-mass – in this case the west coast of Peru. It is 1,290 miles east of Pitcairn Island. 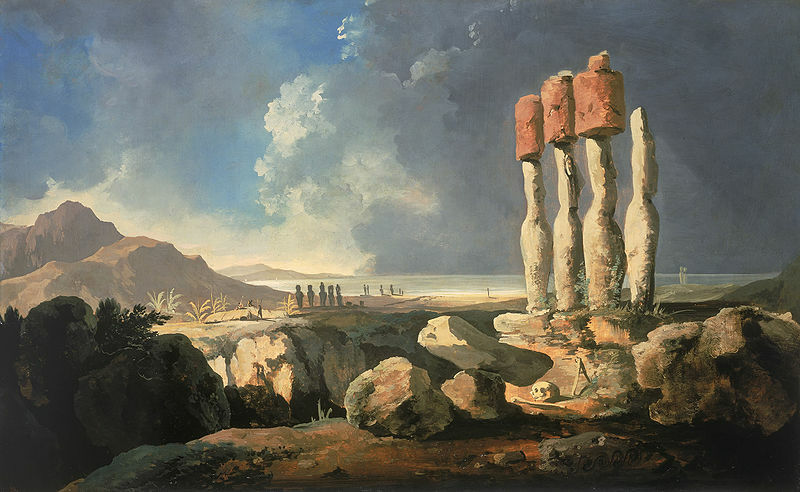 Easter Island by William Hodges 1775. Photo Credit: Wikipedia. Easter Island (Rano Raraku). Photo Credit: Wikipedia. The huge (colossal) statues carved from hardened volcanic ash are called ‘moai’ and they look stern-faced inwards away from the sea, seemingly to gaze towards the horizon for eternity, some stand on ceremonial rock platforms (ahu), especially those at Akivi on the island’s west coast and Nau Nau in Anakena Bay with between 7-15 figures, many having strange top-knots (pukao) on their heads, made from red tuff rock, their eye-sockets are made from coral and the irises from red scoria rock. In all there are nearly 900 statues (most having subtle differences in their appearences), including half-size ones and some that are unfinished, and some kneeling statues. They are said to represent the gods of the Rapa Nui. One of the statues, the ‘paro’ is 33 feet high (10 metres) and weighes in at 76 tonnes; another an unfinished statue is 69 feet high (21 metres), but there are some that are as tall as 24 metres, a staggering 78 feet! Many statues have fallen or been pushed over, maybe by the Rapa Nui tribes themselves as they knew that the end of their island culture was coming – due to a number of factors including abduction for the slave trade, war and disease – indeed by the 1870s only a hundred or so tribes-people remained, and in 1888 the island was finally annexed to Chile. There are some amazing rock carvings on the island, in particular those in the Ana Kai Tangata cave at the south-west side of the island where there are depictions of the so-called ‘birdman’ (Tangata Manu) the supreme chief. The ‘birdman’ also features on a carved rock located above the Motu Nui islet; the cultus of the birdman was centred on the island village of Oronga where there are some well-preserved houses that were lived in by the Rapa Nui, from 1500 onwards. 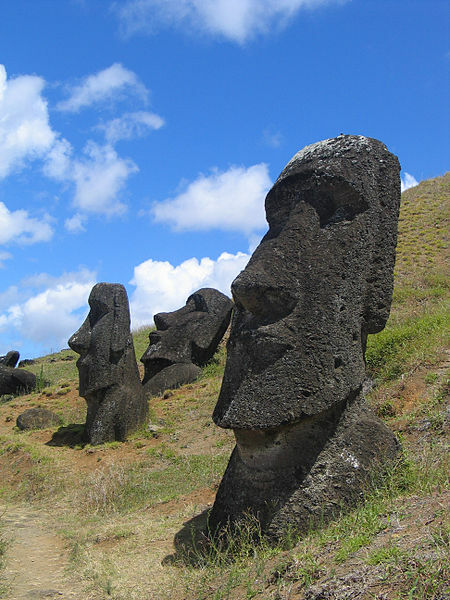 Thankfully the famous statues of Easter Island have been re-erected and now stare, perhaps rather less stern-faced towards ‘a new horizon.’ Today tourists and archaeologists visit Easter Island to stare and to study the huge statues and rock carvings and, at the island that is slowly ‘being lived on’ once again! Hitching, Francis., The World Atlas Of Mysteries, Pan Books Ltd, London SW10, 1979. Pollard, Justin., The Story Of Archaeology In 50 Great Discoveries, Quercus, London W1A, 2007. Strange Worlds Amazing Places, The Reader’s Digest Association Limited, London W1X, 1994. Categories: Misc Subjects, Sacred Island | Tags: Easter Island (Rapa Nui) Pacific Ocean, Easter Island in the South Pacific Ocean | Permalink.